The #1 New York Times bestselling Angel Catbird wasn’t quite what anyone expected from literary icon Margaret Atwood, the author of the increasingly, distressingly prescient The Handmaid’s Tale. 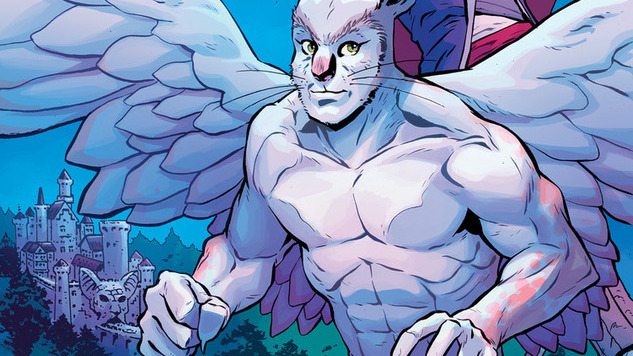 Rather than a layered, symbolic work of high-minded fiction, Angel Catbird is a gleeful romp through Golden Age storytelling conventions, brought to madcap life by artist Johnnie Christmas and colorist Tamra Bonvillain. The second volume of the trilogy, which hit stores this week, sees the titular half-bird, half-cat, half-man hero gathering his hybridized allies to prepare for battle against his rat-mutant former boss, who plots to take over the world and create his own harem of rodent ladies (ick). In advance of To Castle Catula’s release, Paste chatted with Christmas over email to discuss his ongoing collaboration with Atwood and Bonvillain, his debonair design for Count Catula and choreographing feline/rodent fight scenes. Paste: Angel Catbird has such a genuine affection for the Golden and Silver Ages of comics. How actively did you try to incorporate that era into your work on the series? Are there artists from the era who have always had an impact on your work? Johnnie Christmas: One of the fun challenges of Angel Catbird is how to incorporate the feeling of the Golden and Silver Ages without doing a slavish rendition of the look of those comics. So that meant looking at artists that spoke in an allegorical and archetypal way: good vs. evil, light vs. dark, but with the fun and flair that was a hallmark of the Golden and Silver Ages. That meant, at times, looking at artists (who weren’t cartoonists, like Maxfield Parrish or Aubrey Beardsley) who embodied that spirit in their work, alongside comic book artists. Paste: This middle volume is your second collaboration with Margaret Atwood and colorist Tamra Bonvillain. How has your working relationship evolved over the course of the series? Based on the backmatter, it looks like Atwood weighed in pretty actively during the design of the characters and settings. Christmas: The team keeps gelling further along as we go on this adventure. That’s one of the great things about working on the same project, with the same characters and the same world: over time the creative process just gets smoother. As for character design and settings, Margaret has always been an active part of that process. But I think all creatives, involved in building a world from scratch, have an innate sense of what will and won’t work in the worlds of their creation. Paste: This is also the second time you’ve worked on a longer-format story as opposed to shorter serials. Does that change your process at all? Do you have a preference for one scale or the other—these longer volumes versus your Island shorts, for instance? Christmas: I do prefer working on longer works. But only because there’s usually a little bit more time to reflect on the piece as a whole, before it gets out into the world. As opposed to getting a chunk out at a time and looking at the whole thing in hindsight. But really, both lengths have benefits and both can be exciting to create. Paste: A good chunk of this volume centers on Count Catula, the cat/vampire/bat hybrid. Are you a fan of the old Universal or Hammer horror films that this version of Dracula seems to be riffing on, or is that more Margaret’s influence at play? As for the version of Dracula that you do see in this volume, as you know in this volume Catula talks about a fateful meeting between he and Count Dracula. This Dracula is a little bit of a sad fellow, he doesn’t really feel at home in his castle. So he looks a little more like the Dracula in movies. Not full camp, but close. Paste: Catula’s not the only amusing, pun-heavy hybrid in the book. What was your design process like for the goofier feline and avian members of the crew? And can we expect new additions in the third volume? My process involves, first meeting the need of the character’s particular half-human hybrid. Whether it be cat, bat, owl, etc. And doing so in a way that not only stays true to, but accentuates, the personality of the character. When doing character design, accessories can be a subtle way to add in character stuff too. That said, there will be new additions to volume three as well. More fun characters to explore and play with. Can’t wait for you to see them. Paste: One of my favorite sequences in this book was a fight between man-sized animal-people and mouse-marines. How did you go about choreographing a fight scene with that sort of mixed scale? Christmas: Thanks! That was really fun to do. Some characters are pouncing and swooping down to find small, agile targets, while their tiny adversaries are putting everything they’ve got into attacking upwards and attacking in groups. It was very much like drawing a dance with radically different-sized partners. Paste: There are real animal facts scattered throughout the books—has working on Angel Catbird changed your perspective on conservation at all, or brought anything new to your attention? Christmas: I’ve always thought about conservation as an important task, that hasn’t changed. But before Angel Catbird, I never really thought about the particular needs of cats in terms of their care and safety. So the cat facts have positively brought new things to my attention.